Press the raised detent to open the lid. To close the lid, push it down until it latches. 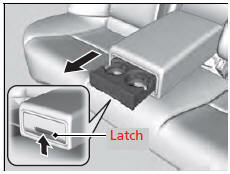 The rear beverage holders are in the rear seat armrest. 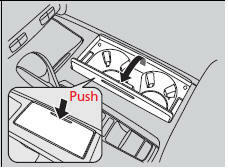 Open the beverage holders by pulling the latch up on the front. Spilled liquids damage the upholstery, carpeting, and electrical components in the interior.